Full ski gear underneath – if it’s going to be nearly 2 hours continuous it’s going to get cold ! The net effect was that the wheel skidded sideways and dragged across the Tarmac … Effectively flat spotting the hard rubber wheel. I tried a heat gun to bring it out a bit back to its natural shape but it was too far gone. This duly arrived last week so jacked up the rear .. 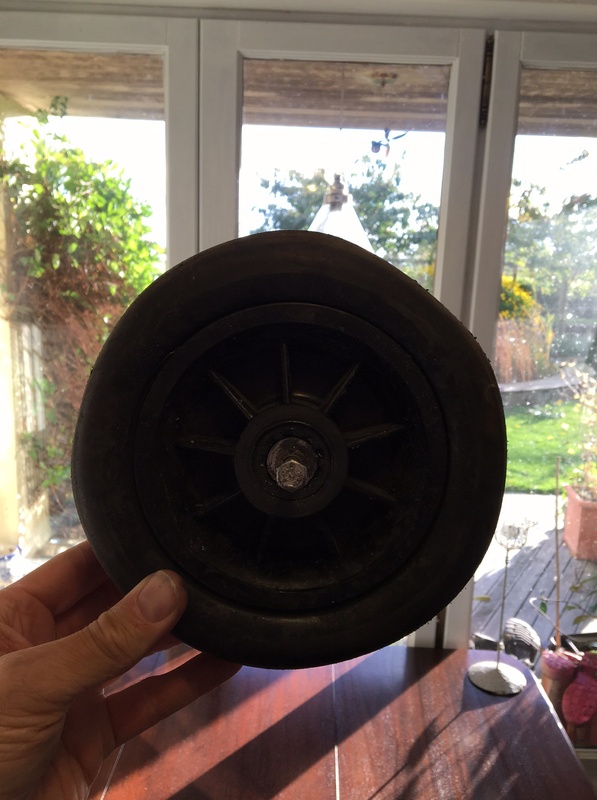 Removed the old wheel which was pretty grubby by now but very nicely greased ! One thing I will need to do is add a nyloc or split pin for additional security. The cable ties that have been securing the main straps of the front harness were cut away and the lap straps retrieved from inside the hanger and clipped into place …..
Will had duly arrived in his full flying suit and hat and was busy running around the pre take off checks along with me. We soon found that the intercom switch I had fitted – which had worked – seemed to have packed in – maybe a bad connection .. so we decided on a series of stick shakes and his acknowledgemet by hand as a means of communicating – along with shouting ! Take off with his 11+ stone on the front was virtually identical to lifting off with just me .. the only thing I would add was that with the now slightly gusting 18kt+ the whole thing felt more stable with the gusts having less effect. This is definitely an aircraft that teaches you co-ordinated use of aileron and rudder .. Howards voice ringing in my ears .. get the ball in the middle ! You can ‘feel’ she is out of balance before you look at the ball … but a quick glance down to confirm and then get it sorted … it will take a bit of time to be as instant on this as I would like ..
We went into a normal right hand circuit which involves flying just offshore around the southern cliff edges and then right back over Corbiere lighthouse to land . we opted for a touch and go – tailwheel all the way down.. speed uder control then up and away again. 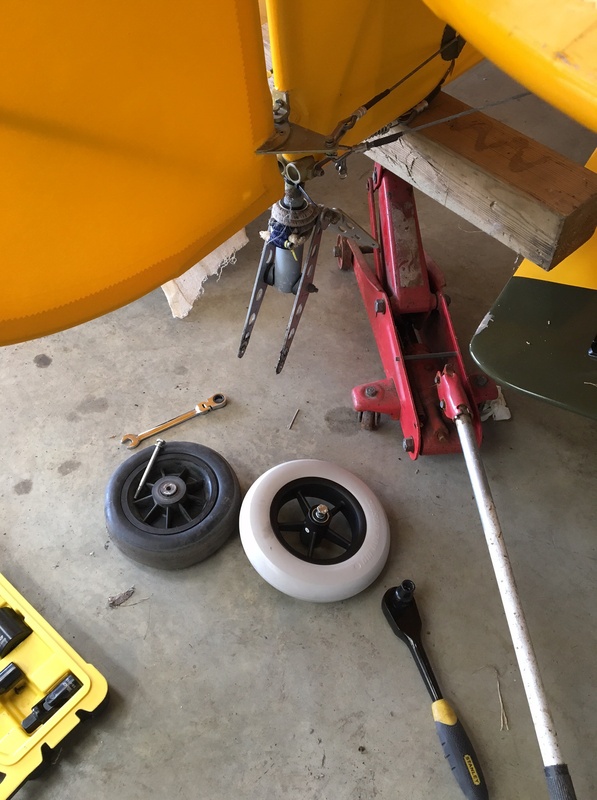 Having opted to disconnect the steerable tail wheel option very early on in the taxy tests – I could sure use it today to assist in preventing ground looping ! I removed the two cables (spliced into the rudder cables) but only removed at the turnbuckle – leaving me the option to reconnect if I change my mind. 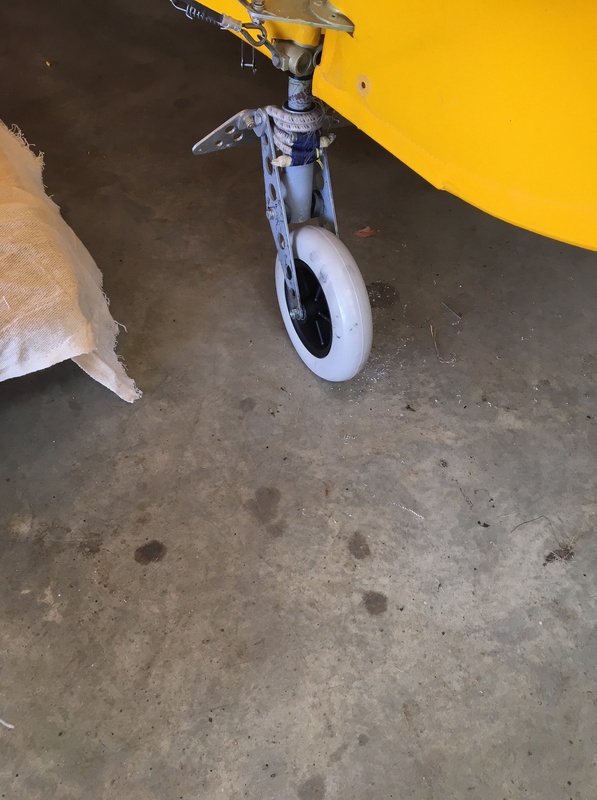 I found that the relatively tight manoeuvring area outside the aero club meant the rudder on full deflection didn’t give the same tail wheel angle and so it dragged and flat spotted … I now get a dunk dunk on taxying – if you know what I mean .. new wheel on order from TLAC. I had decided on this flight to brave the full ’round island .. everything had been settling down and it felt good time for a longer flight. Duly lined up and the tail was up immediately – 18kt down the line … I had mounted the go pro on the rear of the wingtip this time (a la Little Snoring) so you can now see bothe Elevator and Aileron movement. .. doesn’t move much at all ! That cleared I opted for a wheeled landing to just start the tail going down then went around to prevent blocking the runway for too long. off and over St Helier and into a full anticlockwise around the island …. hugging the coast and varying between 700′ and 1000′ … quite bumpy crosswind and possibly the effect of the wind over the 300′ cliff edges … mental note for landing on 08 .. keep the speed up over the threshold. After the full around island I opted to land and check everything over before my next flight which was to include my middle son Will as checker of all things front cockpit and also to see what effect his weight would have ahead of the full LAA checks in a week or so.